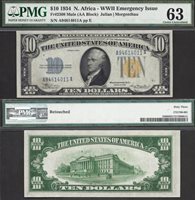 Fr#2308m $10 1934 A91074345A 63PPQ The Rare AA block of the elusive 1934 $10 North Africa issue! 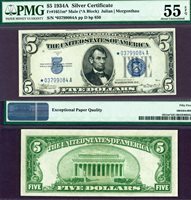 PMG only shows a 63 and 64 without the EPQ designation, and nothing finer. 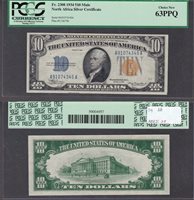 I have personally never seen a more original AA block in high-grade. 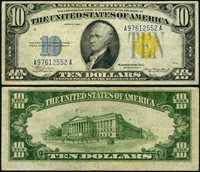 This exact note sold for $51,750 in a 2007 Heritage auction. 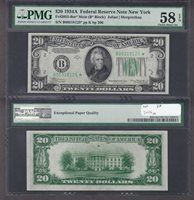 Fr#2055-Bm* $20 1934A B00318125* 58EPQ Of only five graded at PMG of this mule Star variety this is the finest and top pop 12/16. 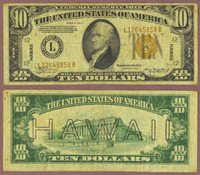 Fr#2305 $20 1934A L60779877A 65EPQ A definite Gem Twenty Hawaii with good margins. 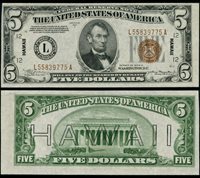 $20 1934A HAWAII F2305. 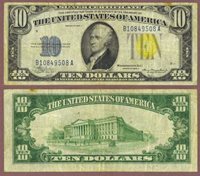 Very Fine, quality example. 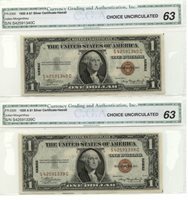 Serial L78447315A. 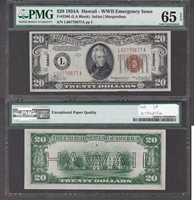 $20 1934 A Hawaii HI San Francisco California CA War Time WWII Emergency Issue! 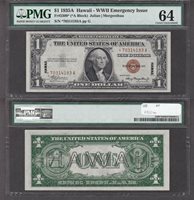 $5 1934 A Hawaii HI San Francisco California CA War Time WWII Emergency Issue!